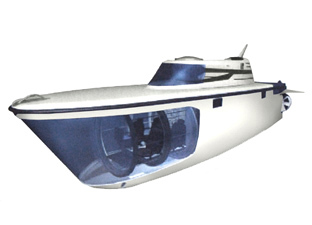 The Discovery 1000 from Florida based company US SUBS was designed for launch and recovery from superyachts, complimenting the motor launch and helicopter probably already there. However the sub also has the ability to operate easily as a shore based vehicle for day excursions, or as a moneymaking tourist attraction for resort locations. The Discovery 1000 is available in a range of sizes from 2 man to 10 person versions. 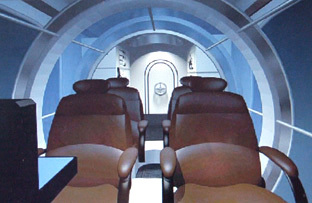 Inside the occupants are offered luxurious seating in an air conditioned atmosphere with an excellent, almost entirely unimpeded view of the undersea surroundings. 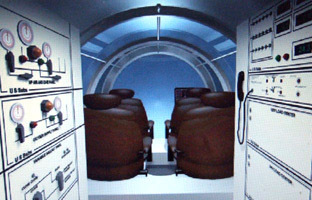 On the surface the sub has similar characteristics to a boat, and while piloting the Discovery 1000 underwater control is relatively simple via a digitally proportional joystick and animated graphic touch screen display. 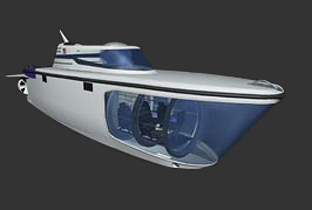 Powered by a 15 KW electric motor with 2 vertical thrusters, 2 lateral thrusters and a 75 cm propeller the Discovery 1000 is capable of diving to a maximum depth of 1000 ft (305 meters), with a range of 56 nautical miles, and running for up to 28 hours underwater at 2 knots, or 2.7 hours at 5 knots. For additional speed the Discovery 1000 can be fitted with a 40 KW diesel engine with hydrostatic drive for dramatically increased surface speed.